This weekend sees the first ever Fermanagh Restaurant Week kick off. The event runs from this Friday (16th September) until next Sunday (25th September) and coincides with Festival Lough Erne which takes place in the grounds of the newly redeveloped Enniskillen Castle on 24th and 25th September. “County Fermanagh is renowned for its Lakelands, and has a growing reputation for top-class restaurants for producing a wide range of high quality foods. Fermanagh and Omagh District Council is delighted to bring these elements together in a festival atmosphere to showcase the hospitality and activity sectors which are so important to the local economy. 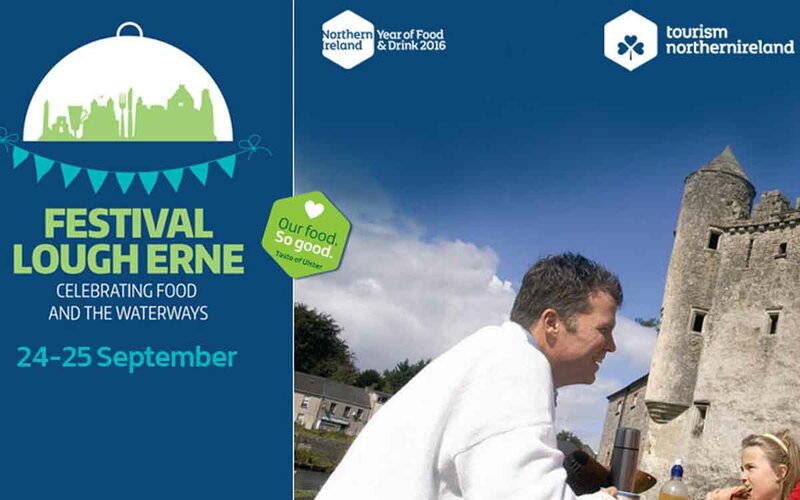 Festival Lough Erne is the highlight of the 2016 Year of Food and Drink for us here in Fermanagh, and I hope it will become firmly established in our calendar of events attracting visitors to Enniskillen and the wider region in the years to come”. Councillor Garrity went on to add that Festival Lough Erne comes at the end of Fermanagh Restaurant Week, another event which showcases all that is best about local produce and celebrates local culinary talent. “Agrifood businesses are very important to our economy, and the chefs who use local produce, and the producers who supply the freshest of meats, vegetables and dairy produce are mutually supportive, helping to create and sustain the local economy,” she added. The highlights of Restaurant Week will include three signature events taking place at Enniskillen Castle from Wednesday 21st – Friday 23rd September, where three of Fermanagh’s best known eateries: Westville Hotel, Saddlers Restaurant & Lough Erne Resort, turn the venue into a pop-up restaurant for the night, serving the very best of their cuisine in the grounds of this iconic visitor attraction overlooking Lough Erne. We’re lucky enough to have grabbed two seats for the Lough Erne Resort pop-up on Friday 23rd and we can’t wait to see what chef Noel McMeel and his team have in store. Diners will also get the chance to eat at Florence Court and Castle Coole, National Trust properties with menus by Tully Mill Restaurant, Florencecourt. Other events include afternoon tea at Belleek Pottery or taking part in the black pudding recipe competition organised by O’Doherty’s Fine Meats during their Black Pudding Festival. There will be seafood specials at Franco’s and a special taster menu in the Killyhevlin Lakeside Hotel. There’s plenty going on to wet the appetite! Fermanagh Restaurant Week aims to highlight the wonderful local produce on offer in the area, combined with the amazing scenery of the Lakelands area, the historic monuments and the iconic Lough Erne, as well as the great range of eateries in the County. This is the perfect event for food enthusiasts with cookery demonstrations, courses and competitions, wine tasting, craft beer events and themed menus such as a “Game of Thrones” speciality menu created by Cafe Merlot, there really is something for all tastes and budgets. Dine on the tranquil waters of Lough Erne on board one of our water buses – the MV Kestrel, Lady of the Lake or take a bespoke tour in the Erne Water Taxi and discover the Lough Erne Food Trail. There is no doubting that Fermanagh Restaurant Week and Festival Lough Erne will make Fermanagh the place to be over the coming week. With the year of food and drink here in Northern Ireland now entering the home straight, this will be the biggest food event in the Erne County in 2016 and we’re looking forward to getting along and experiencing everything on offer. For a full programme of events, please visit www.fermanaghrestaurantweek.com, and for more information on Festival Lough Erne visit www.festivallougherne.com.